Important information on weight loss after 40, and what to do to maintain healthy weight into middle age and beyond. If you miss the days when you could buckle down on diet and exercise to drop a few unwanted pounds within a reasonably quick period of time, you’re not alone. Older adults, especially women, face physiological changes that can promote weight gain and, even worse, muscle loss. Talk about a midlife crisis. Once women reach 40, their likelihood of becoming overweight or obese sharply rises. In fact, about 68 percent of women aged 40 to 59 are overweight or obese–a 17 percent increase compared to women between the ages of 20 and 39–according to data from the 2003-2004 National Health and Nutrition Examination Survey (NHANES) (1). Hormonal changes may be to blame, researchers suggest. A large study conducted by the International Menopause Society found that hormonal changes in women alter the way the body distributes fat in the body, making it more likely to accumulate in the abdomen as visceral fat (2). Visceral fat worsens existing hormonal changes by acting as an endocrine organ itself, pumping out hormone-like compounds that increase inflammation and the risk of insulin resistance related to type 2 diabetes and cardiovascular disease. Get quality sleep. According to the National Sleep Foundation, up to 61 percent of postmenopausal women have issues with falling asleep or getting enough quality sleep most nights (8). A major reason for this loss of sleep is due to instances of hot flashes. Hot flashes can disrupt sleep because body temperature drastically increases, leading to discomfort and waking. Consequently, lack of sleep has been associated with increased levels of the hunger hormone, ghrelin, and decreased levels of the satiety hormone, leptin, leading to overeating and weight gain. Make sure to get enough fiber. Middle-aged women commonly face gastrointestinal changes caused by fluctuations in hormones that lead to bloating and sluggish intestines (9). These feelings can affect appetite and energy level–two important aspects of staying on track with diet and exercise goals. To support bowel health, drink plenty of water throughout the day and eat sufficient amounts of fiber. In addition to getting fiber from whole grains, beans, fresh fruits and vegetables, you can supplement your diet with a fibre supplement (such as Psyllium husks) to reach the recommended 25 grams per day. 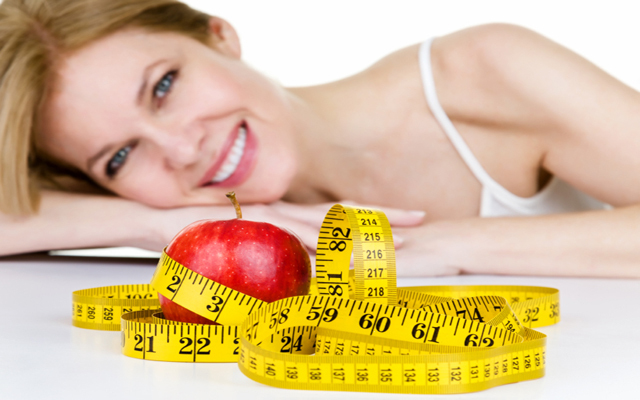 While there may be additional challenges when trying to lose weight as a midlife woman, nutritional cleansing provides you with the tools to alter your lifestyle and reach your weight-loss goals. Take your health into your own hands and make 40 and above feel like 30 all over again.